Next Tuesday, thousands of gamers will disappear from the face of the planet. Husbands, wives, fathers, mothers, brothers and sisters will be snatched away in an instant. Fortunately, they won’t have gone far; they’ll just be locked away playing Bloodborne, a game that could well take over your life. Bloodborne is the spiritual successor to the cult classic Dark Souls, a notoriously difficult RPG that both infatuated and infuriated gamers. While it’s not a sequel, it shares a developer (From Software) and, as we’ll find out shortly, quite a few gameplay elements too. As the title suggests, the plot of Bloodborne centres on a nasty illness that turns people into deranged beasts. Your character, who you create from scratch, visits the city of Yharnam, a Victorian-esque metropolis pulled straight from a nightmare to try and find a cure. Unfortunately, most of Yharnam’s residents have Derangedbeastitis and quite fancy having you for dinner. Don’t go expecting hours of cutscenes and dialogue explaining the origin of the disease or your purpose in the world, though; as Dark Souls veterans will attest, From Software prefer to take the less is more approach to storytelling. You’ll get the odd conversation here and there, but for the most part you’ll have to discover Yharnam’s secrets yourself. Gameplay-wise, Bloodborne shares quite a lot of characteristics with Dark Souls. If you’re not familiar with Souls, that pretty much means hours of exploration, a difficult-to-master combat system and lots and lots of dying. However, early previews suggest a couple of key differences. The main difference, and perhaps the one that’ll convince people who didn’t like Dark Souls to give Bloodborne a try, is the combat system. Whereas Dark Souls relied on methodical defence and perfectly-timed attacks, Bloodborne is faster and sleeker, with characters able to dual-wield guns and swords. The trade-off is that enemies are a lot faster too, and often attack in waves too. While Bloodborne gives you more freedom to attack, your chances of getting battered by some faceless monstrosity are still fairly high. Talking of faceless monstrosities, the tough-as-nails boss fights we know and love from Dark Souls are back too. We haven’t seen many of them yet, but you can be certain they’ll be controller-smashingly hard to beat. In fact, the whole game is likely to be ridiculously hard. In an interview, Bloodborne’s project director Hidetaka Miyazaki claimed that even he is finding it hard to beat the game’s ‘New Game Plus’ mode! 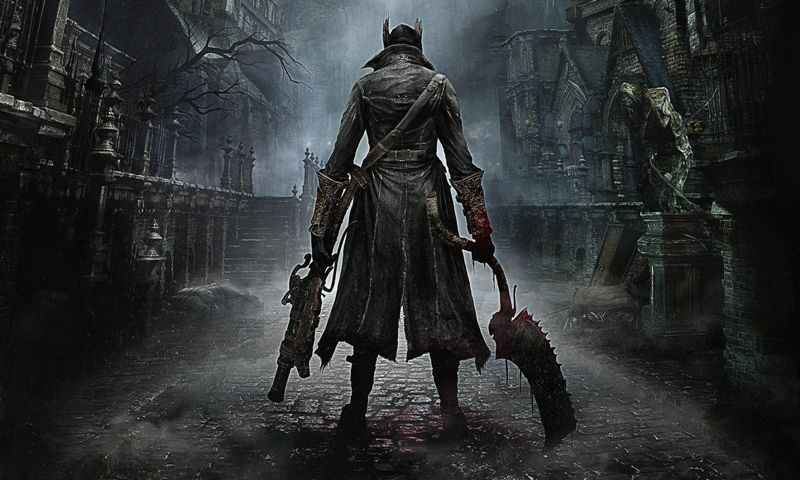 As well as being difficult, Bloodborne is going to be long. The seasoned gamers at Edge Magazine played the game for 40 hours and still didn’t manage to complete it. Dark Souls 2 took an average of about 50 hours to complete, so expect something in the same region. Still, anyone who has played Dark Souls will tell you that all of that pain and frustration is well worth it in the end. Bloodborne is out on Tuesday 27th March, exclusively for PS4. If you’re an Xbox owner desperate to play it, sell Xbox One and use the money to buy a PS4 – or, if you just need some extra cash for the game itself, sell PS4 games! Just click the button below to get started.